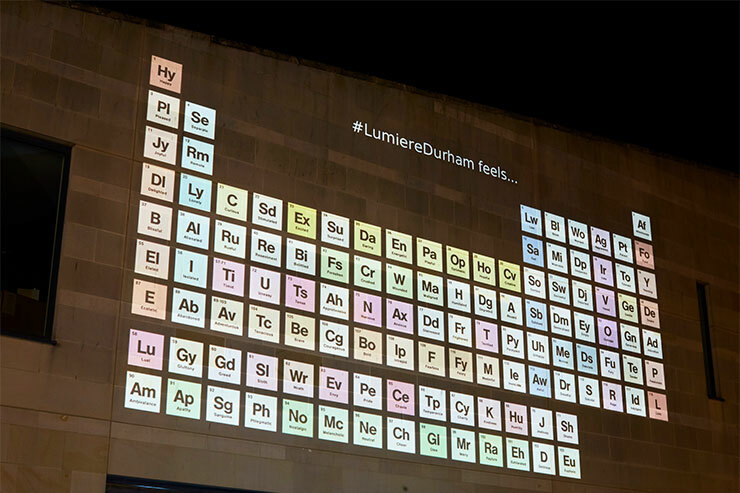 The fifth edition of Lumiere Durham was held over four nights, 16th-19th November 2017. 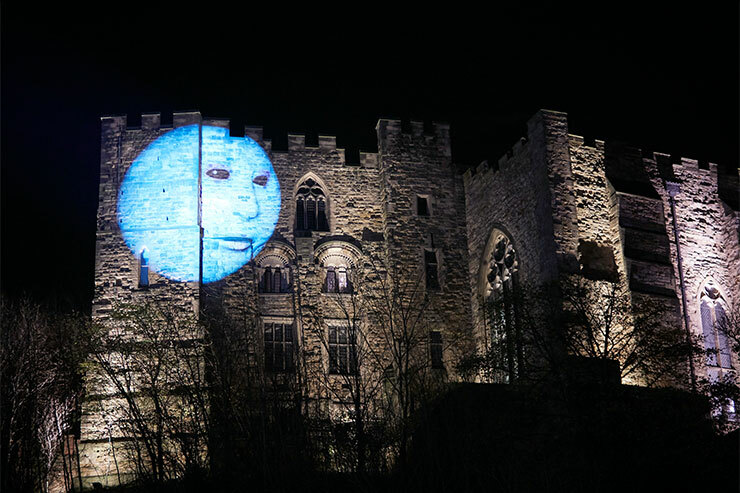 The tiny medieval city of Durham is the birthplace of Lumiere. From its inception in 2009, the audience has grown from 75,000 to 240,000 in 2017, when it generated an economic impact for the county of £7.5m. Artichoke invites international and UK artists to respond to Durham’s unique architecture and landscape and works to extremely high technical specifications to produce as seamless an audience experience as possible. 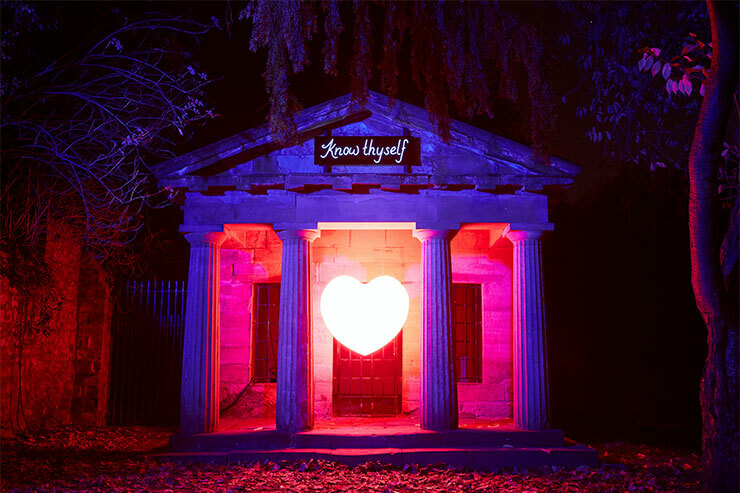 Audience favourites of Lumiere 2017 included ‘What Matters’ by Schuster & Moseley, a glittering installation of thousands of pieces of illuminated coloured glass pieces depicting the birth of light in the universe, hung inside St Oswald’s Church, and *Frequencies* by Finnish artists Kari Kola, a 360-degree light installation and soundscape along the tree-lined banks of the River Wear. *Dome and Arches* by the Italian architectual lighting firm Luminarie de Cagna, were fairytale structures studded with tens of thousands of tiny LEDs. 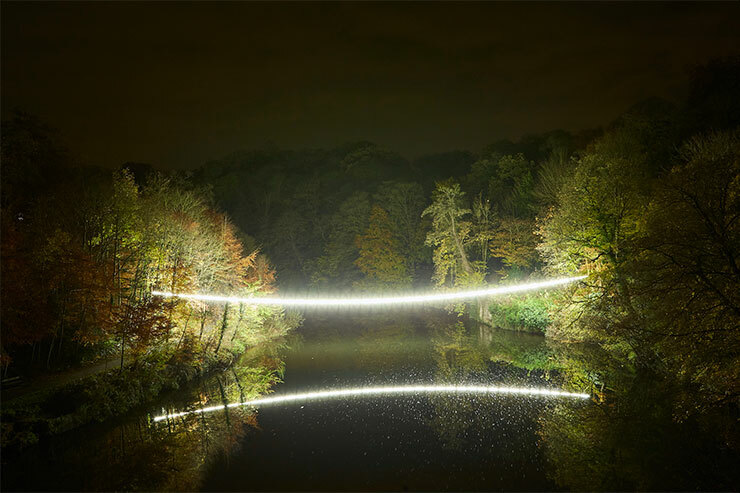 Adam Frelin’s ‘White Line’ was a simple yet effective fluorescent line that followed the natural curve of the River Wear, casting moonlight-like highlights and shadows across the water and altering the space around it. 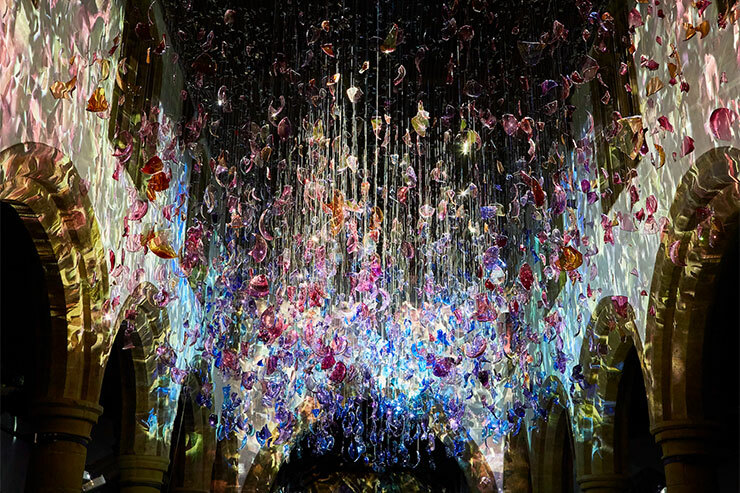 ‘Methods’, by Spanish artist Pablo Valbuena, was an ambitious new commission at Durham Cathedral which used the building for Lumiere in a completely new way. Inspired by the 17th century art of change ringing in which bells are rung in a series of numerical sequences, Valbuena focused on the extraordinary architecture of the building itself, dividing it into ten segments, each one corresponding to one of ten bells in the bell tower. All the bells were fitted with sensors and the spatial sections of the building were lit up in time to the rhythm of the bells, as they were rung by teams of bell-ringers. The effect was a remarkable synergy of sound and visual time-based patterns onto both the interior and exterior of the cathedral. 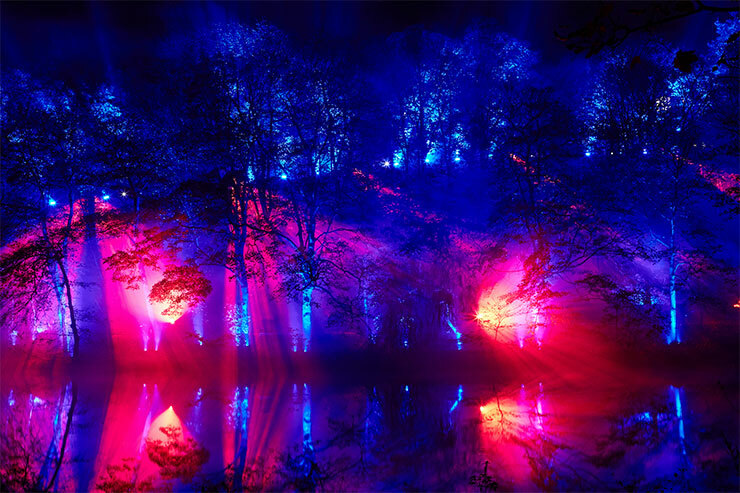 Artichoke makes a point of engaging and developing local artists in Lumiere through its BRILLIANT scheme, which invites anyone either living in or from the North East, to submit their idea for a lightwork to the competition. 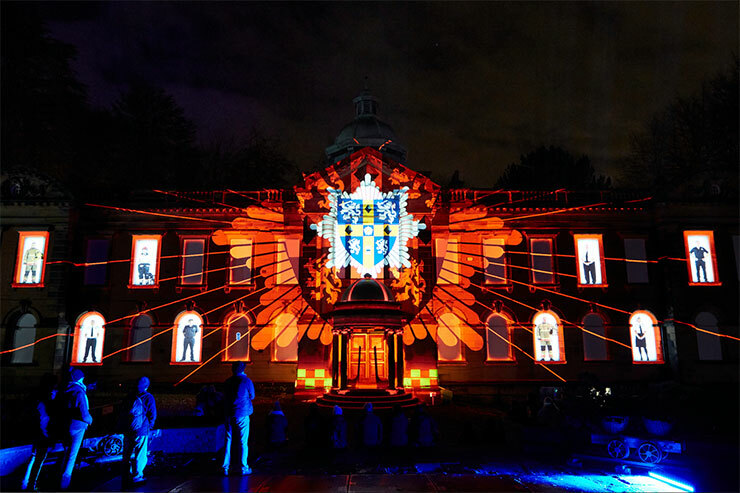 In 2017, winners included ‘Know Thyself’, an illuminated throbbing red heart by Finola Finn informed by her studies of medieval emotions and installed in the tiny Count’s House by the river, and *Sagacity* by Aidan Moesby, an interactive installation inspired by the Periodic Table of the Elements, which took the emotional temperature of Lumiere by inviting the audience to tweet their emotions and see the corresponding word illuminate on the screen. Local people and communities have become central to the story of the festival, both as inspiration and as context for many of the installations. 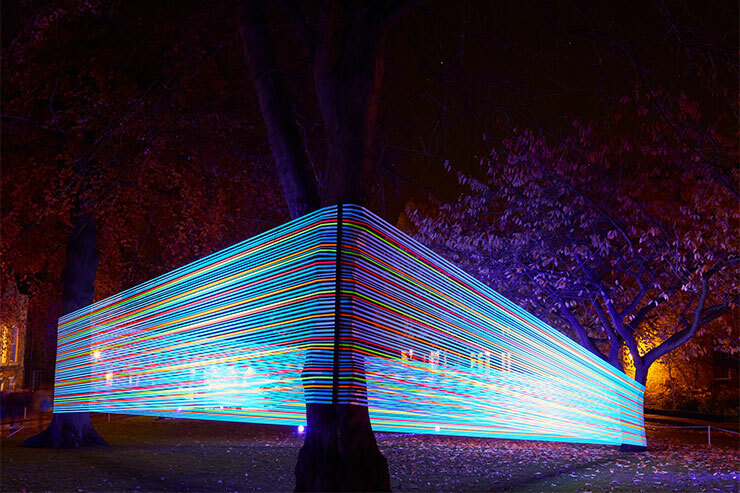 Lumiere 2017 delivered the greatest ever community outreach opportunities involving 1,700 people across the county, participating in and contributing to artworks such as ‘The Umbrella Project’ by Cirque Bijoux, ‘Our Moon’ by Hannah Fox, and ‘The Common Good’ by Shared Space & Light.